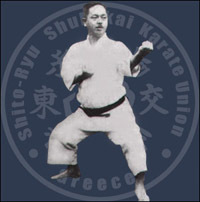 The Shito Ryu school of Karate was founded by Mabuni Sensei. Mabuni Sensei had trained under two of the greatest masters of Okinawan karate: Anko ITOSU (Shuri Te) and Kanryo HIGAONNA (also known as “Kanryo Higashionna“) (Naha Te). In developing Shito Ryu, Mabuni Sensei incorporated both the Naha Te and the Shuri Te systems together with katas from the Chinese White Crane system that he had learnt from the legendary Go Ken Ki (known as Wu Xianhui), a Chinese tea merchant who lived in Okinawa at the time.